Most weeks I already have an idea about what I'm doing for Tool Time. I even have a TTT box of things I collect. This weekend was busy and Sunday was a computer (blogger) nightmare. As you can see, I changed my header. I thought I would just remove the picture, try another and then put the original back. To make an 8 hour story (with a few tears in there) very short, this is my new header. It's temporary, because my very talented daughter Courtney designed me a new one. I won't be using it for a while...I can't take another computer adventure right now. What does all that have to do with this week's TTT. 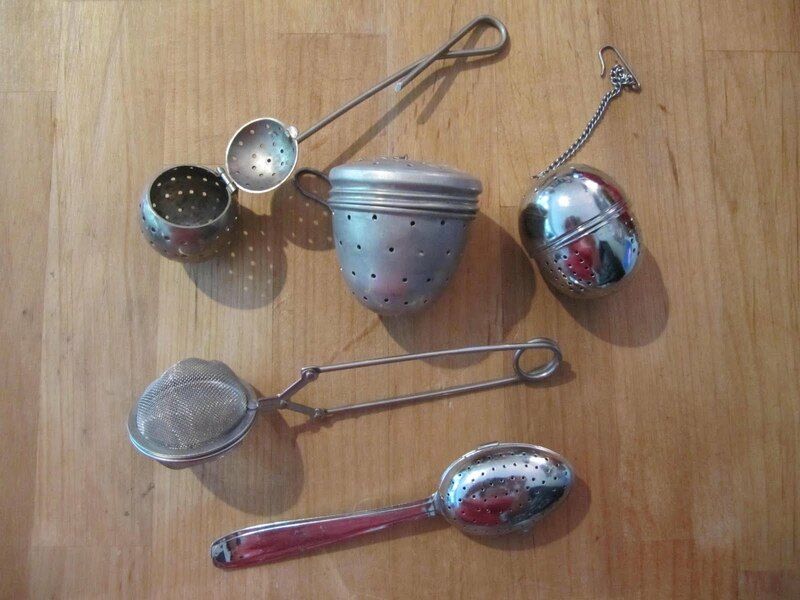 Well, my old header had a tea for one tea pot and an antique tea ball. I was roaming around my sewing room Monday morning trying to find some inspiration when I spotted all these...my little tea ball collection. I love tea, tea balls and tea pots. Here's a picture of my favorite tea pot. Disney is our favorite place on earth and this little Minnie teapot sits on my desk! So, after all that blah, blah, blahing, here is my little inspiration. I wanted to make something sewy (is that even a word), because last week's was the Washer Toss Game. 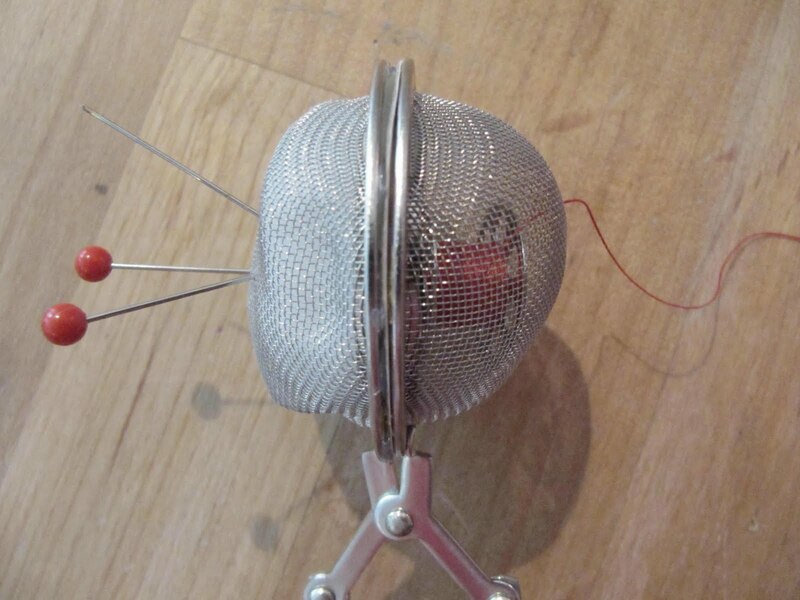 There's nothing sewier than a pincushion!!! 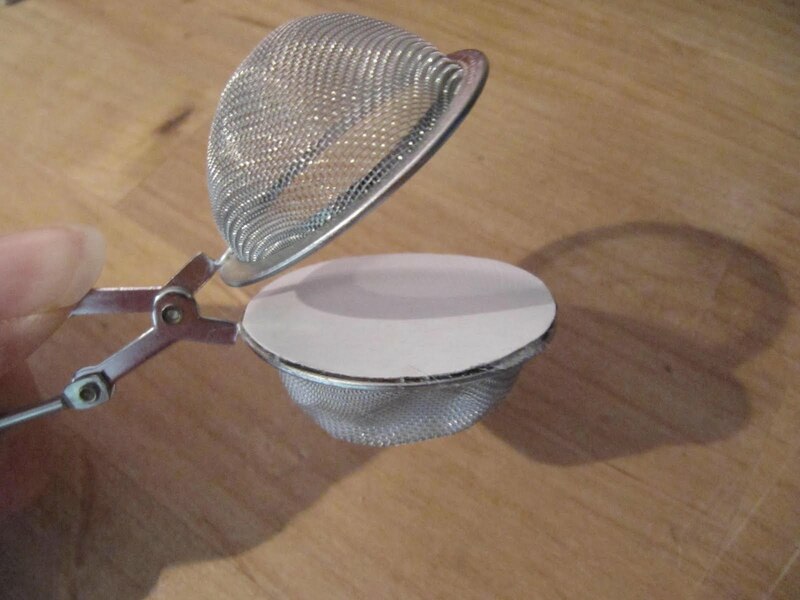 This is a mesh tea ball. 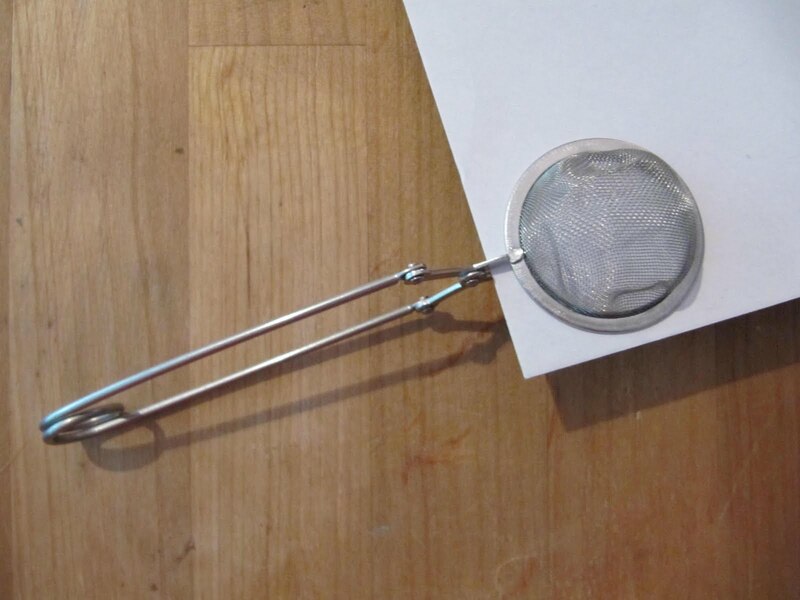 Tea leaves go inside to infuse the water for a nice cup of tea. Yah...right, not on Tuesdays!! Open it up and clamp it on card stock. 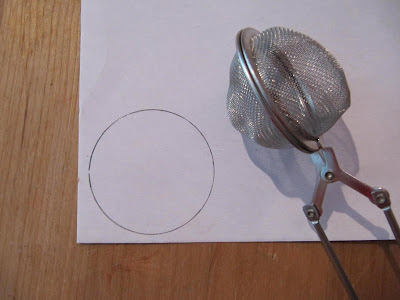 Cut it out and make sure it fits the circle. Now here's the part where you're probably going to say..."she's nuts". 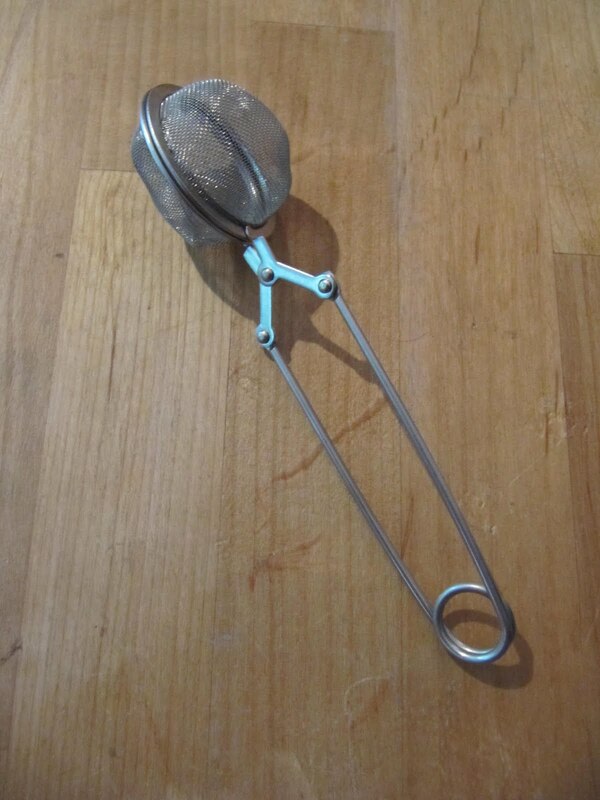 Place stuffing in one side of the tea ball. Cover with the card stock circle. and glue in place. I just used a little hot glue all the way around the rim and a dab in the center of stuffing. Here you have it... A pin cushion. Woo Hoo! See that top part? It's empty. What better place to store something for sewing. A bobbin of thread of course. 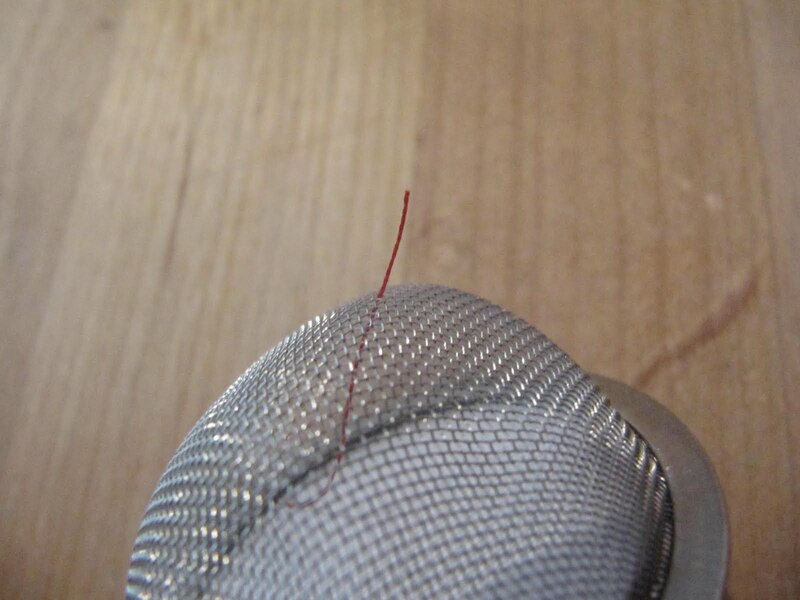 but before you close it, thread the thread through the wire mesh from the inside to the outside. Now it's perfect. 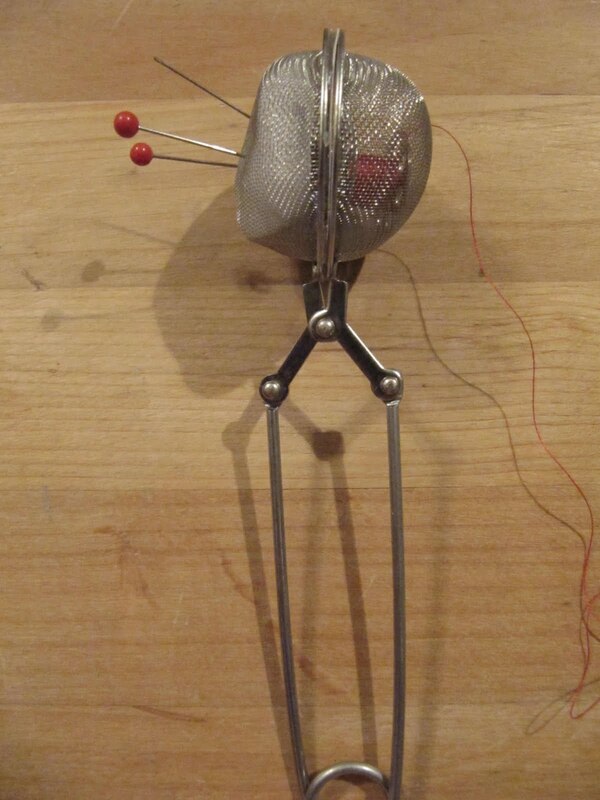 Needles and pins on one side...thread on the other. 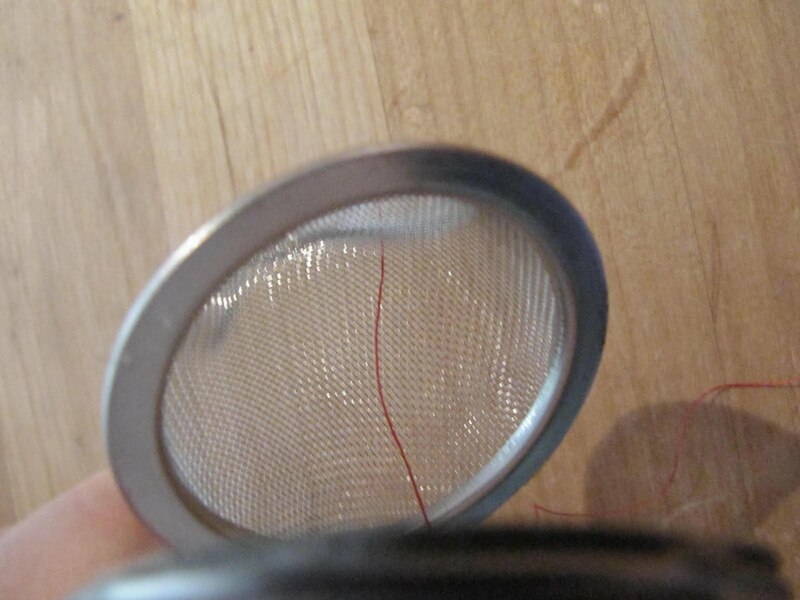 The thread is safe and sound in there. You won't lose it and it stays nice and clean. Just pull the thread out through the wire and the bobbin spins inside the tea ball. 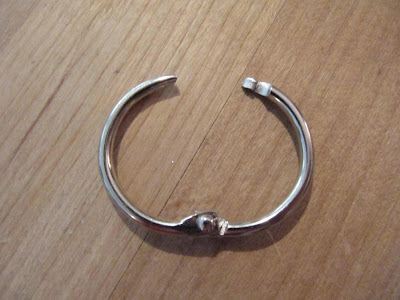 Take a key ring that hinges open. 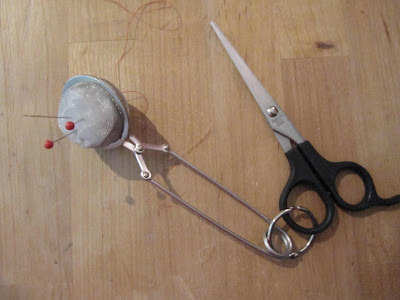 Hook it to the ring on the bottom and add your favorite little scissors. You can also add a badge clip to the bottom ring too. 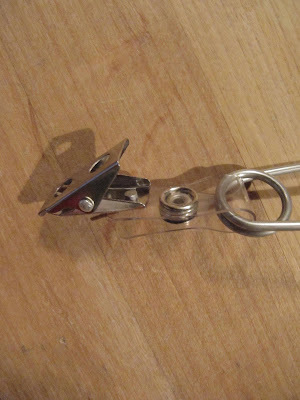 Just clip it any where on your clothing so that it's always where you want it when hand sewing...especially in the car. 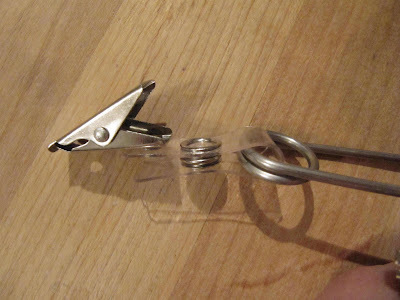 Never lose your thread or scissors again. 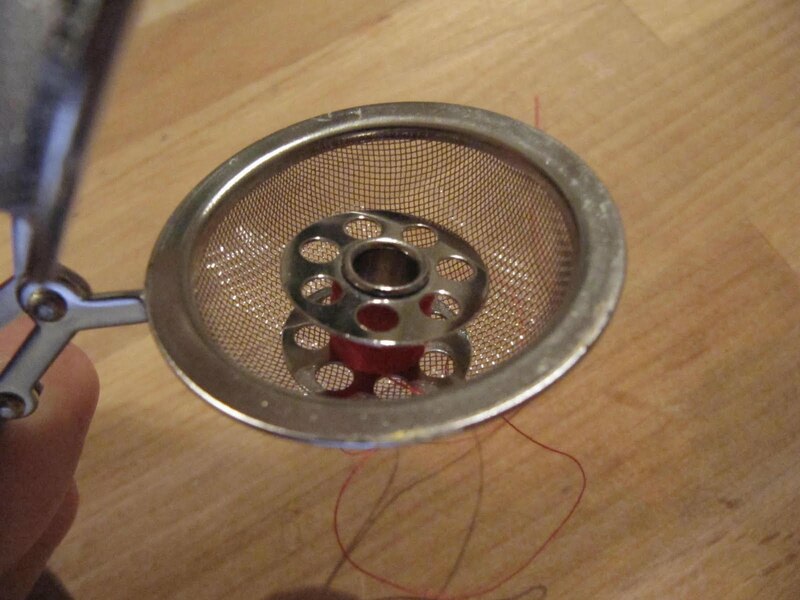 You can find these mesh tea balls in most kitchen sections. 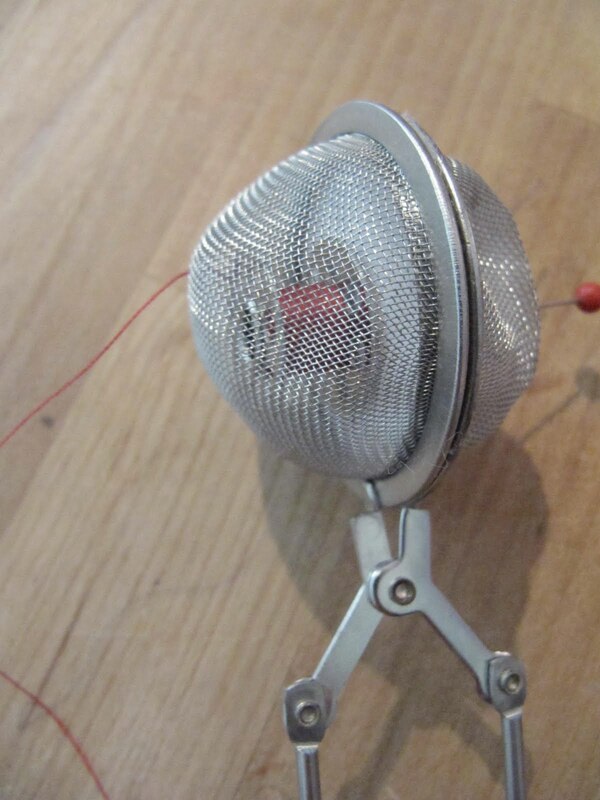 I did a search on Amazon under Mesh Tea Balls and a bunch came up. Prices ranges from a $1.75 on up. 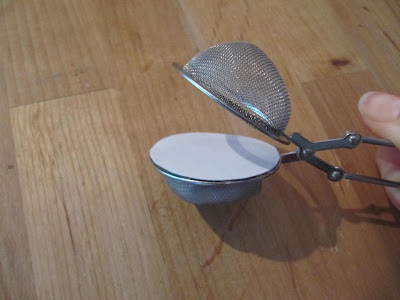 There were some small mesh balls that weren't the clamp style, but the ones that hang from a tea cup with a chain. Those would work great too. Now lets go make a ...a what? What to name this. 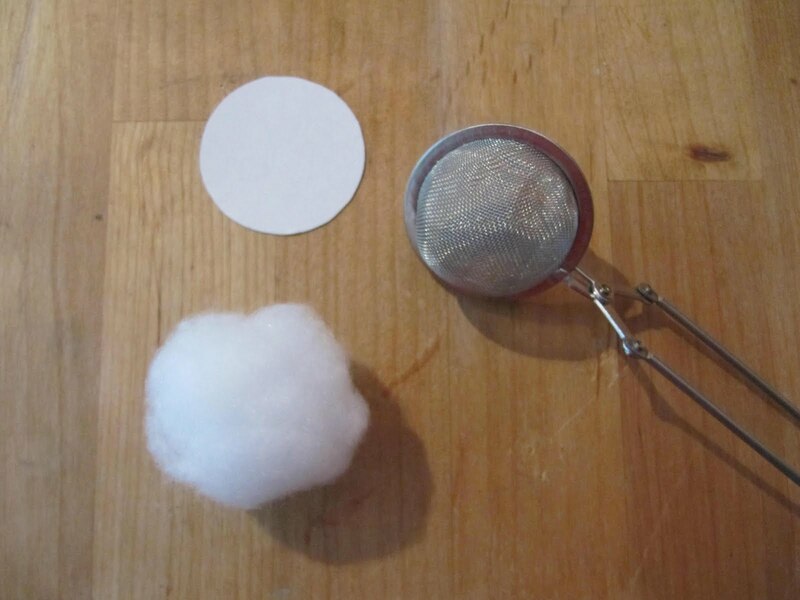 How about a "tea cushion" or a "sew ball" or how about "sew meshy". What ever the name, make one for yourself or a friend. Great gift idea too. Happy Tuesday Everyone. I hope you have a magnificent day! I'm going to go have a cup of tea. I love this one, Karen! How about using it for traveling. Take a small needlebook with pins and needles and put as many bobbins in different colors to fit in the mesh ball, with the scissors attached. 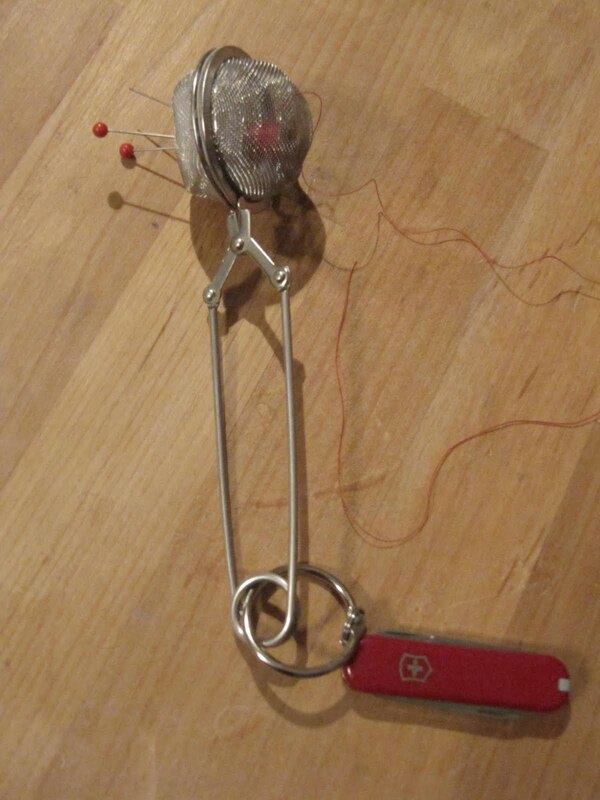 The needlebook can also be chained/tied onto the handle of the ball. LOL, you always get us thinking! Too cute! 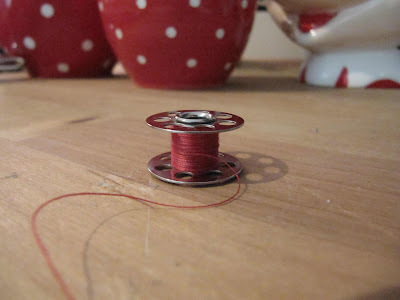 I would have stopped at the bobbin, but you just keep the great ideas coming! Thank you! I am sorry about your blog troubles. Looking forward seeing your new header! You are truly thinking outside the box! 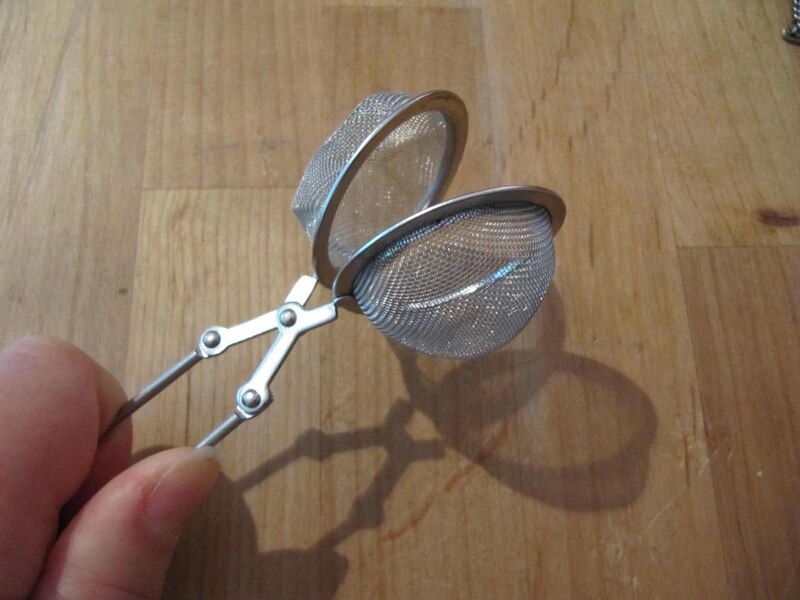 So clever use for the tea ball! Justlike someone said...it cracks me up!!!!! haha!!! Sorry to hear about your blogger nightmare. Sometimes I feel like making changing to my blog design but I have heard stories like yours and I am afraid to do it!!! I am looking forward to seeing your new header...but I must confess I will miss the old one too!!!! Who could have thought that up, only you cause you're so clever. 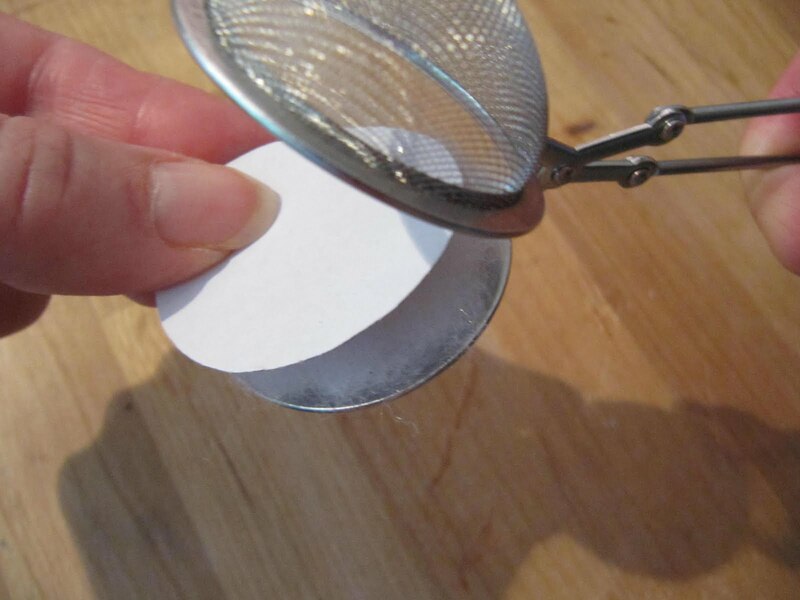 Great idea - I may try that with one of my several collectible teaballs that no longer hold the tea leaves too well!!! Drop by and visit us for Tea on Tuesday!!! That is actually really neat!!! Sew clever, Karen! I like your temporary header. It's simple and clean. How about a cha-tea-laine? You always come up with fun ideas. That is just the cutest thing! Now I'm going to be looking at things with a new eye! Karen....you are so cleaver!! I so enjoy your blog!! Okay, BRILLIANT!! out of the drawer comes my tea holder - luckily I've got several. I love your ideas and especially this one! 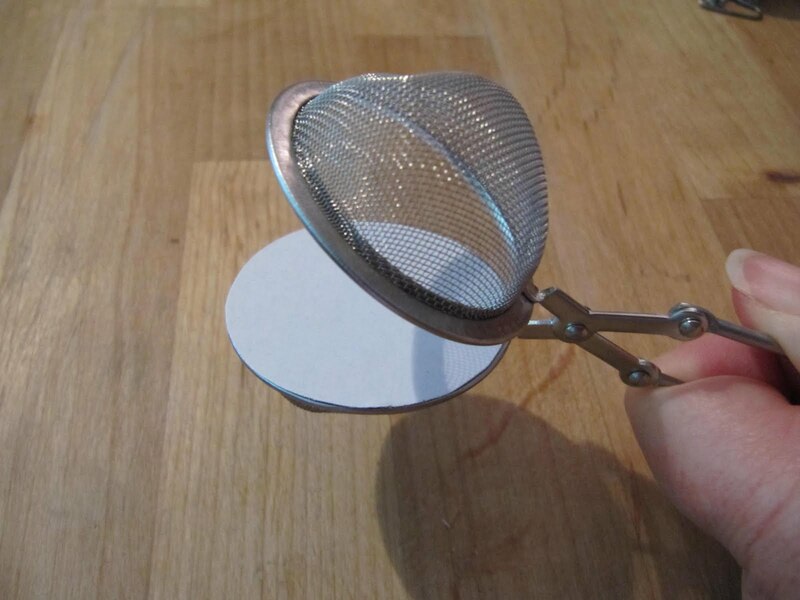 I have to make some for my little tea parties! Thanks for the great idea and tutorial! Nice collection of tea balls! I always look forward to Tuesdays. I love your ideas and you inspire me to get thinking too. Your temporary heading is nice and I look forward to seeing your new one too. Great Minnie you have, we're big Disney fans too. I love this little do-dad, it's just perfect for taking to the couch. wOw..... you continue to amaze me every Tuesday!!! LOVE this. Genius!!!! I am going to HAVE to have one of these. This would also make a great item as a donation to raise funds for our outreach program. 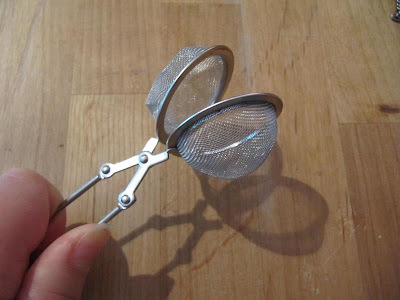 I don't drink tea but I am going shopping for these tomorrow! Great idea. 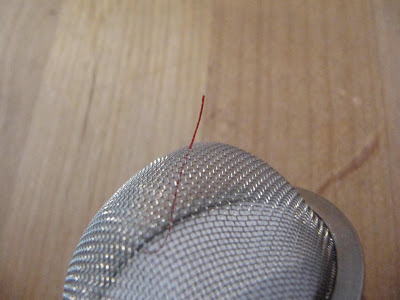 I think it would be very useful when handsewing the binding on a quilt. Especially when you want to take it out with you to do "on the road". Keep up the good ideas! Wow! What a great idea! Thanks for sharing! Sorry to hear about your computer troubles. I too like the new header, plain, simple easy - pops up faster on my dial up:) I think this is very unique. I'm going to try to find one of these at one of my yard sale outings. Great holiday gift for my sewing friends. Another great idea! 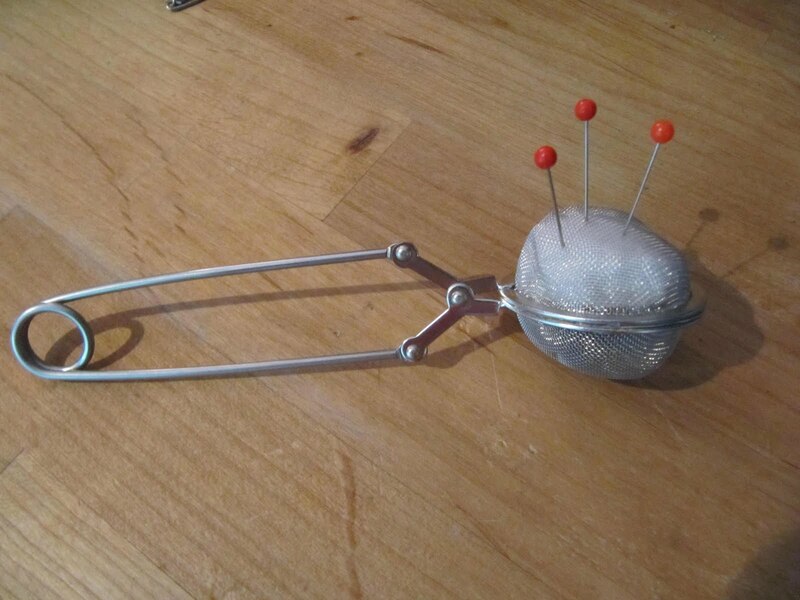 I have several of those spring type tea balls. Karen sweetheart, you never cease to amaze me!!! You ingenious girl!!!!! I love how your mind works! I hope you are well darling, and I plan to catch up properly soon! That is the cutest thing I've seen in a long time!! I am a tea drinker and have one of those tea balls on hand. I am definitely going to make one! I can never get over the number of ideas you can come up with. I think quilters and tea, go hand in hand. You are so clever Karen, love the new idea! For a minute I thought you were going to cover the mesh with a cute fabric. 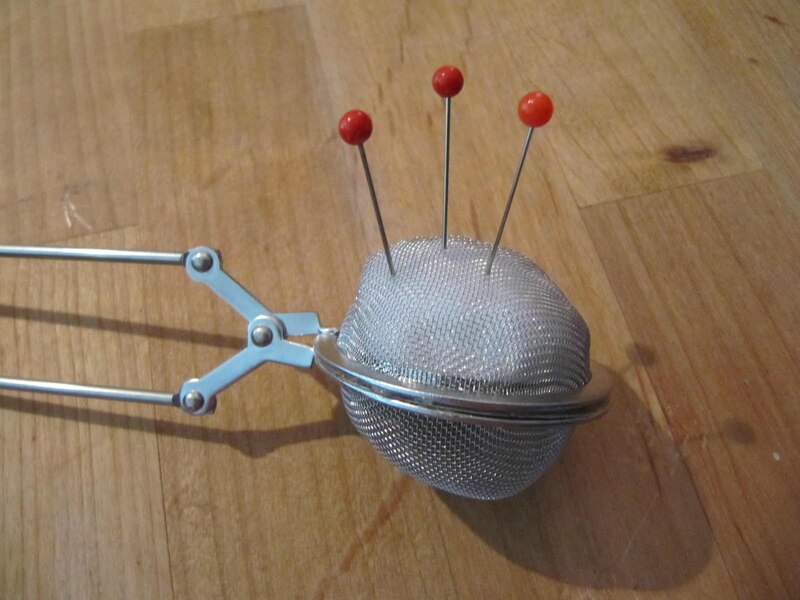 You probably could on the side for the pin cushion. also just wanted to say HELLO! My name is Shellie and I recently came across your blog -- of course, the AccuQuilt giveaway! I'm a sewer/quilter/lover of all things organized AND I live in New England, too (currently RI but born and raised in MA). Feel free to stop by my blog which I just started last week. Just some garment sewing posts so far but I'm an avid quilter as well. So happy to find you! 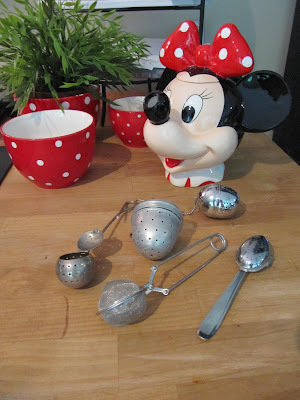 I am swooning over your Minnie Mouse teapot! 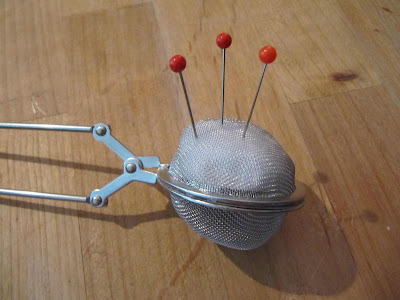 Cute little idea for the ball tea holder, I still like to use mine for teas. 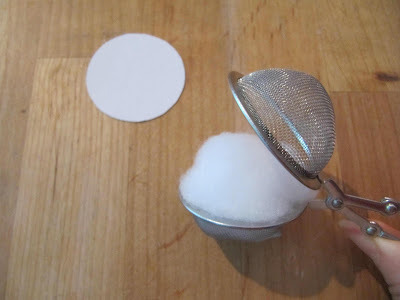 But a few weeks ago I used it to sprinkle a little bit of powdered sugar on a small dessert. It's easy to scoop up just the right amount of powered sugar, then let it close and tap it against a spoon and there your done. Oh yea I love your site.